It’s time! We have heard our followers and have created new “In A Pikle” products. We are excited to announce ALL “In A Pikle” fans can support us in bringing these products to market by following & funding us on Kickstarter! Kickstarter is an exciting platform we have chosen to present our new products and help “In A Pikle” grow. It’s an “all or nothing” funding opportunity that allows YOU the first opportunity to purchase these new products AND support us, Marianne Porter & Tamara Foster, the creators and owners of “In A Pikle”. We must reach our funding goal of $20,000 to receive any support. But wait… what’s the new product you ask? It’s actually TWO new ideas that we know you are going to love! Now that you know about the new products GO LEARN MORE & SUPPORT US on Kickstarter! It really is as simple as 1-2-3! 1- GO to our Kickstarter page. 2- PLEDGE from “In A Pikle Supporter” to “Platinum In A Pikle Backer”. 3- RECEIVE your “In A Pikle” reward once the project is complete. It’s that easy! 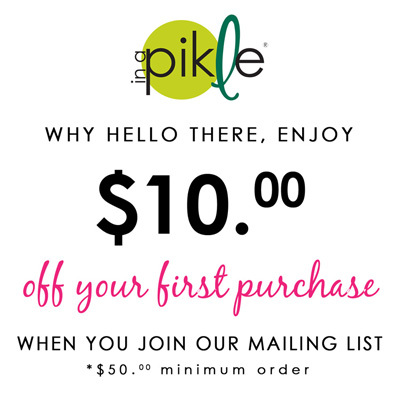 To make it even easier, if you fund “In A Pikle” before October 20th we can guarantee delivery of your reward before December 25th! If you have any questions please reach out to “In A Pikle” by email, kickstarter@inapikle.com. We are happy to support you in your inquiries.